In 1791, Antoine Court de Gébelin (1719-1784), the Protestant pastor and Freemason, publishes the VIII volume, entitled "History, the Heraldry, the Coins and Games", of his monumental work called "The Primitive World". 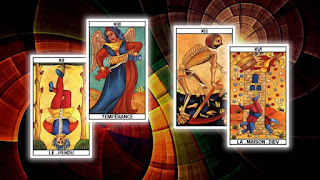 There is a long section devoted to "Divinatory Tarot". According to this author, the Tarot come from Egypt, and it would be a book attributed to god Thoth, the Ibis-headed god. In Egypt, Thoth was the patron of astronomers, accounting, magicians, healers, charming and diviners. Thoth would have taught the divine magic to some initiates with the purpose of transmitting it to the Hierophants, to the large priests, to the wise and to "all those who have eyes to see and ears to hear". The Pyramid, which made with stones symbolize a perfect shape, also represents for the man the symbolic image of the interior temple, which is at once an architect and worker. The path of the divine perfection, which man must strive to follow would be symbolized by the book of Thoth, the Tarot. The name of Tarot, according to Court de Gébelin, derives from two terms Egyptians: tar (via, road) and Ro (king or real). Then the Tarot would be "track of the king", which leads to a vulgar man to become king. According to other views, the word Tarot would be related to the name of the Jewish law, the Torah. It has also been related with the Latin term "rota" (Wheel) associating it with the "wheel of the existence". Anyway, currently is named Tarot to a game of cards composed of 78 cards, and that number has remained unchanged since the sixteenth century. • 56 ordinary cards divided into 4 series (sticks or colors: Swords, Cups, Wands and Coins) of 14 figures each: 10 figures numerals (1 to 10) and 4 figures (Honors) that represent the Page, the Knight, the Queen and the King. In the divinatory Tarot these are the Minor Arcana. • 22 triumphs composed of 21 figures numbered 1 to 21 and a special trump (“The Fool”). In the divinatory Tarot, these 22 victories are the Major Arcana. If the eternal wisdom of ancient Egypt persists and remains in the symbolism of the Tarot, other assumptions were added to the mysterious and colorful history of the Tarot. According to the opinion of other esoteric researchers the Tarot would have been distributed by the Tatars who, after having invaded China in 1215, invaded Russia at 1238 and disseminated the cards throughout Europe. Others are inclined to think that the great conquerors, those who dared to cross seas and discover other cultures for Europeans, were those who did know the Tarot in the north of Italy. Such would be the case of Marco Polo, who spent long years in the court of Kublai Khan, from where would have been imported to Venice the card game known by the Chinese. It is known that the games of cards were very much appreciated in China and that, since the 10th century, the emperor Mu-Tsung, spent regularly a lot of time playing a card game inspired by the game of domino. It is important the role of the Gypsies in the history of the Tarot. The Rroms likely came from India and its presence is attested in Western Europe from the Middle Ages. The Rroms or Gypsies would have entered in Europe cards to play and also to predict destiny. They always have been well-known in the art of fortune teller. While it cannot be said with certainty that they imported the Tarot, at least, have an undeniable involvement in the use of the cards as Oracle, cartomancy. Anyway, what we can say with certainty is that the game of Tarot cards, as we know it today dates from the Renaissance. The chronicle of Giovanni Juzzo of Caveluzo of 1379 preserved in the archives of Viterbo, mentions a game of cards from the Saracens, called "naibi". The hypothesis of an oriental origin of the game of cards seems to be confirmed from a “mamluk” deck preserved in the Topkapi Museum of Istanbul. It is a deck hand-painted, almost complete, composed of four sets: dírhams, cups, scimitars and mallets, that could be used as models for the suits of the Spanish Decks (Coins, Cups, Swords and Clubs) and that were transcribed in the Minor Arcana of the Tarot as we know it today.